On a clean, dry surface sprinkle a small amount of flour to prevent sticking and lay down your sheet of defrosted puff pastry. Using a rolling pin, roll the pastry into a 12”x12” square of even thickness. Using a knife or pizza cutter, cut the pastry into 9 even squares (3 rows of 3). In a mixing bowl, combine the Mozzarella, diced pepperoni, mushrooms, pizza sauce and ¼ teaspoon of the Italian seasoning and stir until well combined. Spoon a tablespoon of the filling into the center of each pastry square (should use all the filling) and spread it a bit diagonally toward two opposite corners. Get a small dish of water and lightly spread a bit of water around the edges of a square. Fold one corner over diagonally to meet its opposite corner and form a triangle. Press the edges of the pastry together to seal the filling inside. Repeat with each pastry square. Cover a baking sheet with parchment paper and transfer the triangles to the sheet. Combine the egg and a tablespoon of water in a bowl and whisk together to combine. Use a pastry brush to brush the egg wash over top of each pastry triangle. 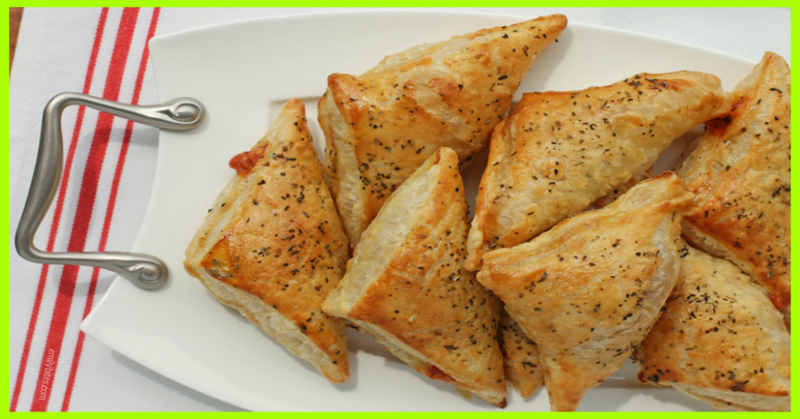 Discard leftover egg wash. Sprinkle the remaining ¼ teaspoon of Italian seasoning over the tops of the triangles. Preheat the oven to 400. Place the baking sheet into the refrigerator for 10-15 minutes to ensure the pastry is still a bit chilled (this makes it puff better). Transfer the sheet to the oven and bake for 15-18 minutes until pastry is golden. *Since you definitely won’t use all of the egg wash I calculated the nutrition information and Weight Watchers points using the values for ½ an egg.